The agreement also provides for technical support, maintenance, operation and repair of helicopters. Russia and India signed an agreement to assemble no less than 200 Ka-226T helicopters in India, state technologies corporation Rostec said Monday. According to the corporation, the agreement also provides for technical support, maintenance, operation and repair of helicopters. "The State Corporation Rostec will organize in India the production of the Russian Ka-226T helicopter and its modifications in the amount of not less than 200 units," the statement reads. A preliminary agreement on the production of Ka-226T light multirole helicopters — NATO reporting name Hoodlum — was reached after talks between Russian President Vladimir Putin and Indian Prime Minister Narendra Modi in December 2014. 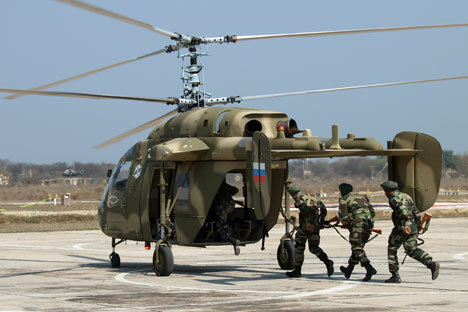 Having agreed to make these helicopters in India, Russia was offered an initial deal for manufacture of almost 200 of these helicopters, with the potential to increase the number by another 400. With a maximum take-off weight of 4,000 tons, the Ka-226T is designed for cargo and passenger transportation to hard-to-reach mountainous areas and rescue and patrol operations. The helicopter is equipped with two Arrius 2G1 engines made by the Turbomeca Company. The passenger version of this aircraft can carry up to seven people, while the transport version can carry one ton of cargo inside the fuselage or via an external sling. For transportation of oversized cargo, a high-capacity cargo platform can be installed instead of the regular transport cabin. Ka-226T is scheduled to replace the Cheetah and Chetak helicopters currently being used by the Indian Army.